One of the most significant modifications in the general addressing model in IPv6 was a change to the basic types of addresses and how they were used. Unicast addresses are still the choice for the vast majority of communications as in IPv4, but the bulk addressing methods are different in IPv6. Broadcast as a specific addressing type has been eliminated. Instead, support for multicast addressing has been expanded and made a required part of the protocol, and a new type of addressing called anycast has been implemented. Let's start by looking at multicast under IPv6. Multicasting is used to allow a single device to send a datagram to a group of recipients. IPv4 supported multicast addressing using the Class D address block in the classful addressing scheme. Under IPv6, multicast addresses are allocated from the multicast block. This is 1/256th of the address space, consisting of all addresses that begin with 1111 1111. Thus, any address starting with FF in colon hexadecimal notation is an IPv6 multicast address. The remaining 120 bits of address space are enough to allow the definition of, well, a gazillion or three multicast addresses. (Okay, it's officially about 1.3 trillion trillion trillion addresses.) Much the way the allocation of unicast addresses was organized by using a special format to divide up these many bits, the same thing was done for multicast addresses. 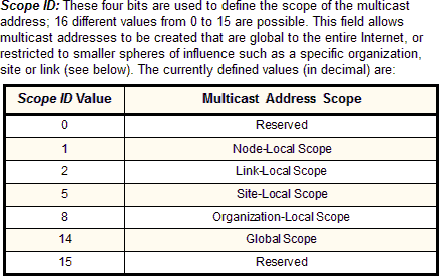 The format for multicast addresses is explained in Table 65 and illustrated in Figure 101. The first eight bits are always 1111 1111 to indicate a multicast address. This used to be called the Format Prefix before the term was dropped as explained in the topic on IPv6 address space allocation; the field now has no name. Flags: Four bits are reserved for flags that can be used to indicate the nature of certain multicast addresses. At the present time the first three of these are unused and set to zero. The fourth is the T (Transient) flag. If left as zero, this marks the multicast address as a permanently-assigned, well-known multicast address, as we will see below. If set to one, this means this is a transient multicast address, meaning that it is not permanently assigned. Group ID: Defines a particular group within each scope level.